Aren't old buildings so beautiful? Nice shot! Just beautiful! I love old barns. Old barns have such a unique charm. I absolutely love it - it almost looks like a book cover! I love old buildings as photo subjects. Great color and texture. 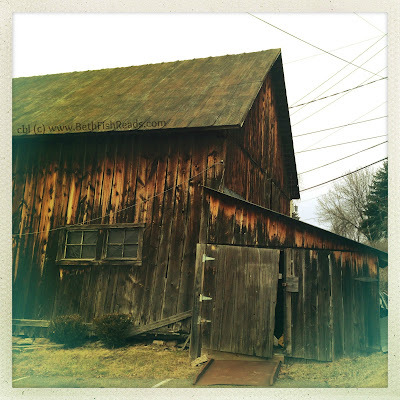 Love the wabi-sabi-ness of this barn. Thank you. Here's my (wordy) Wordless Wednesday! I grew up playing in old barns. This is a little nostalgic for me! What a gorgeous photo - well-done! I take pictures of old buildings, too, but I've never done as nice as this. great character...but someone needs to fix that door. The building is nice, but the photograph itself is even better, love the haze and the way it almost brings to mind history by itself. It looks like it's been there a while. Oooo I love it! I love old buildings and your composition really captures it nicely. Great shot! I'm crazy about old barns! That weathered look to the wood is so gorgeous. Looks old but still beautiful. Love the colors! Even though the colors aren't vibrant, they are very complimentary, and make this picture stand out. Love the structure and the way the light hits it. I love how a picture of an old barn has so much character. Great photo! This looks very similar to an old barn that used to be near my house. Very cool.